Lethbridge, AB - ASDC SW and Vauxhall Academy of Baseball are hosting a Winning Edge Seminar with Talent Development Specialist and Organizational Performance Consultant, Jeff Krushell. Over the last 25 years Krushell has forged relationships globally with amateur & professional athletes and internationally renowned coaches, sport scientists, doctors and researchers. Krushell is regarded as a noted expert in human performance and talent development with a message that relates to all levels of human performance and is not exclusive to sport. Through his work he has gained unique insights into the process of improving performance in sport and the workplace. Krushell is currently a strength and conditioning consultant with the Vauxhall Academy of Baseball and Major League Baseball International and previously worked with the Toronto Blue Jays and Edmonton Eskimos as a strength and conditioning coach. Krushell can be heard as host of The Krush Radio Show on TSN 1260 in Edmonton and at RadioInfluence.com. 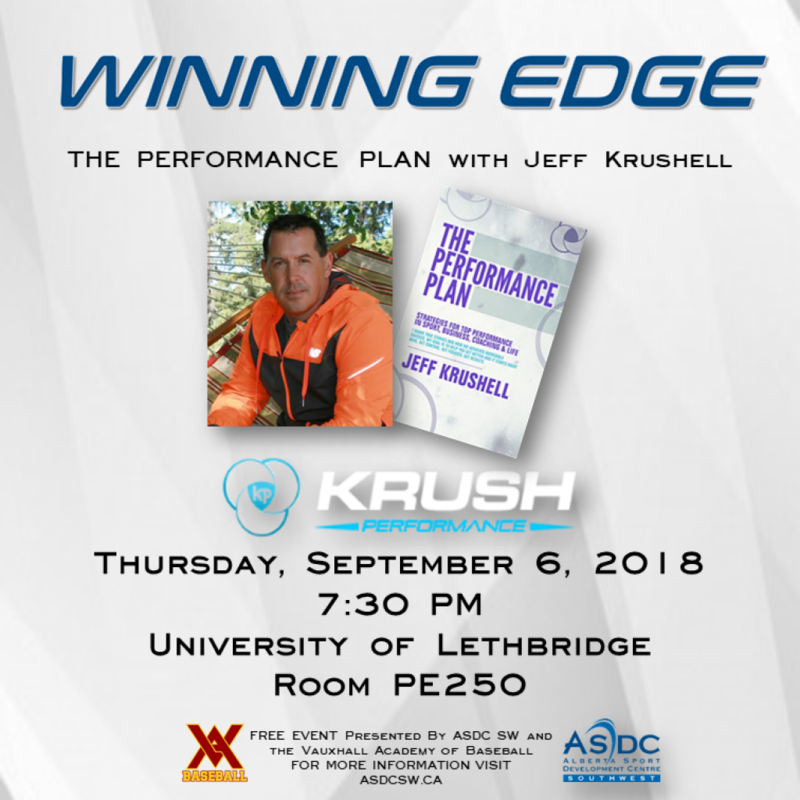 Krushell will be discussing his book, The Performance Plan, in Lethbridge on Thursday, September 6, 2018 at the University of Lethbridge room PE 250. This free event is presented by Alberta Sport Development Centre Southwest and Vauxhall Academy of Baseball and open to all athletes, coaches, parents and business leaders. For more information and to RSVP visit asdcsw.ca.